The works of Ayad Akhtar walk a fine line between irony and stereotype; they are swan songs to the Islamic spirit, promoting audiences to examine preconceptions while not shying away from dark, uncomfortable political themes. If in the wrong hands, this kind of subversion can go terribly wrong, underscoring rather than subverting Islamic stereotypes. For the most part, TheaterWorks’ production of The Invisible Hand, directed by David Kennedy, navigates this tightrope walk with impressive poise. The Invisible Hand is a political thriller, centering around American banker Nick Bright, who finds himself kidnapped by a band of Pakistani activists. To meet his ten million dollar ransom, Nick agrees to play the stock market and mentor one of his captors, Bashir. Nick’s belief in and Bashir’s cynicism towards the power of the American dollar quickly come into violent, nail-biting conflict; altruism is corrupted by greed as Nick leads his captors into the addictive world of free market capitalism, turning economic theory into a matter of life and death. Akhtar is a masterful writer – his play Disgraced won the 2013 Pulitzer Prize – and his deftness at crafting personal tension amidst a political backdrop is on prime display with this production. Much of this precision comes from the powerhouse ensemble of actors, and no wonder: this is a remount of Westport County Playhouse’s 2016 production, with only Anand Bhatt (playing Dar) appearing as a new face. The tension amongst the four actors is electric, and the power play that erupts and shifts throughout the story is palpable. One of the areas in which Akhtar’s masterful irony is lost, however, is in the pacing of Kennedy’s staging. Fajer Kaisi is explosive in his rendering of Bashir, – but much of the nuance of the character falls flat due to the rather one-note scene work: if rated on a dramatic Richter Scale, most of the beats in this production are played at an 8+, leaving limited room to humanize Akhtar’s complex characters or provide moments of reflection. Eric Bryant as Nick has more opportunity for nuance, as he is often on the losing end of the narrative’s tug-of-war for power, and Bhatt is endearing as the young Dar. Rajesh Bose as Imam Saleem, the group’s seasoned leader, provides the most compelling performance, depicting shades of sympathy, greed, cruelty, and fear beneath an imposing exterior. Much of the production’s success is the work of an astounding design team. Kristen Robinson’s set is uncomfortably realistic in its griminess and simplicity. Most astounding of the design contributions comes from Matthew Richards’ lighting, depicting the dismal fluorescents of Nick’s prison cell to the soft sunshine occasionally peeping through the window. It’s disappointing that Kennedy didn’t take advantage of transitions to help mark the passage of time. Rather than use those moments to draw out the sheer enormity of Nick’s captivity by keeping the audience in the world of the play with him, the production opts for blackouts, complete with confusing lights and sound that would feel more at home in a Star Trek episode than a political suspense. Luckily, costume designer Harry Nadal’s impeccable work helps guide the audience through the seemingly eternal timeline of Nick’s confinement, with the evolution of the ensemble’s clothing depicting shifts in power and authority. 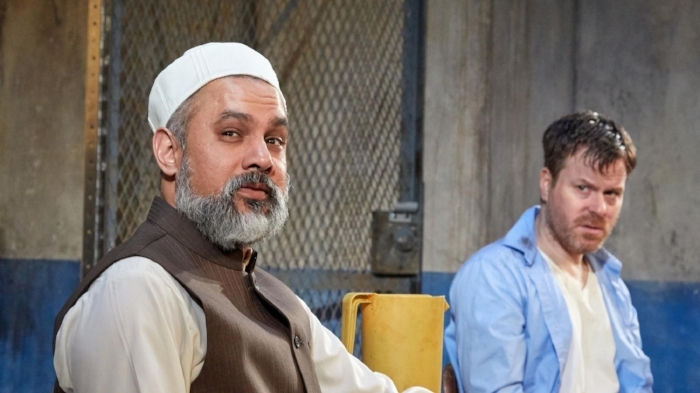 Akhtar’s plays are messy and uncomfortable, and as deftly as Kennedy’s staging is, there’s only so much subversion that can happen when the majority of an audience is white. I questioned while watching the production how much the audience grasped the irony that the playwright subtly intends, and found myself itching for dramaturgical context; although a lobby display appeared in the works during press night, TheatreWorks would benefit from the work of a seasoned dramaturg to help patrons – largely cultural outsiders to the world of the play, myself included – understand the more complicated layers of Akhtar’s challenging story. As a whole, TheaterWorks’ production lives up to expectations: it’s suspenseful, intimate, utterly thrilling at moments. It’s a worthwhile story to experience in this political moment, when capitalism and greed are even more in the American forefront than usual. I do, however, recommend that interested audience members do some research prior or subsequent to seeing the play to more deeply understand Akhtar’s, and his characters’, unique and nuanced perspective.